Tattoo Blog » Meet Nate Beavers! Tattoo Blog » Inspired » Meet Nate Beavers! I don’t personally know Nate Beavers and I’ve never met him, but I think he’d be the kind of dude that I could very easily get along with. For starters, Nate is an excellent tattooist. 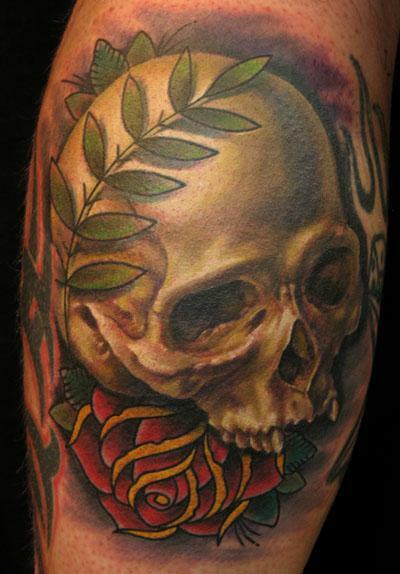 His work is rich in colour, shape, texture and all that good stuff that goes along with any quality tattooist’s work. It’s pretty hard not to respect anyone who can put out a steady stream of tattoo work, despite only having been working as a serious tattoo artist for somewhere in the neighbourhood of seven years. Next, Nate has a great work ethic. He’s serious about what it means to be a tattooist and what it means to be an artist in general. Aware from the beginning that he didn’t want to follow the path of the scratcher or someone who tattoos out of their basement, the moment the idea to become a tattooist struck, he began working to make it a reality, even though he wasn’t sure exactly how to go about it. As a result of this, Nate got his start in the tattoo world very quickly, working the front counter for a year at tattoo studio in Houston, Texas while doing a tiny apprenticeship. After this quick insight into tattooing, he was almost immediately set loose to tattoo for real. With the stakes high and a great deal of importance placed on his own confidence to deliver the goods, Nate brought the ruckus and continues to do so. He has an immense respect for his clients and for the work that they want done. This in addition to talent makes Nate Beavers worthy of the attention of anyone who values great tattoo art. Lastly, Nate Beavers believes in the power of community that exists within the tattoo industry. He can see how getting all the artists on the same page in terms of connections and friendships between shops can only serve as a plus for the entire tattoo community. This in turn can further the art form, pushing it in new directions and making tattoo something much more than it currently is. I couldn’t agree more with him. Interested in Nate Beavers’ tattoo work? Check out his stuff and contact info here.